I get that anyone who was born in, lives in, or has ever accidentally crossed the border of New Jersey has a contractual obligation to love Bruce Springsteen. I also get that conservatives have a long history of reappropriating Springsteen’s music in ways he didn’t intend and wouldn’t approve. 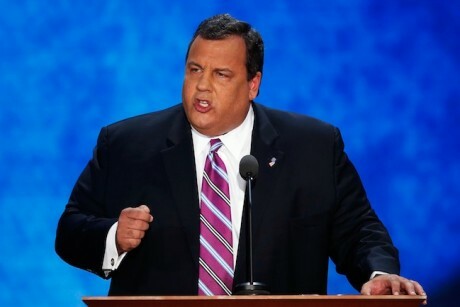 But still, there’s something so unseemly about Chris Christie referencing Darkness on the Edge of Town during a keynote speech at the 2012 Republican National Convention that it can’t go unaddressed. This article in The Atlantic explained Christie’s Springsteen obsession at great length, and this follow-up blog post by Jeffrey Goldberg goes even further into the governor’s Boss-loving soul. Christie thinks that Springsteen’s music is universal, that it speaks to the human condition and more specifically to the American condition. As a Springsteen fan, I can certainly understand that and respect it to a point. But Christie chooses to willfully ignore the politics inherent in Springsteen’s last 34 years of recorded music (Jesus). It’s all well and good — and probably healthy — to separate the art from the artist. So for Christie’s love of the Boss to never waver even while Springsteen played Vote For Change tours and stumped for the likes of John Kerry (Jesus) is almost admirable. But for Christie to patently ignore or blithely misinterpret the songs themselves is hypocritical, arrogant, self-serving and obtuse. While Goldberg’s piece certainly makes clear that Christie prefers the inspirational rockers to the “dour” folkie parts of Springsteen’s career, the governor is still going out of his way to misread those songs — to see no politics where politics exist, or to distort ideas so wildly as to render them meaningless. It must be a painful thing, Christie’s Springsteen fandom. It’s an exercise in self-delusion, in forcing the material to conform to your beliefs. He basically uses Springsteen the way Christians use the Bible, as a weapon of convenience. To love Bruce Springsteen as a prominent conservative politician would be like being a huge Elton John fan if you’re homophobic. Or a huge GG Allin fan if you’re coprophobic. Or a huge Nickelback fan if you hate douchebags. Christie, presumably the 2016 Republican nominee for President if Obama wins, dropped a Darkness reference during a fiery speech and what is undoubtedly the single most conservative political convention in U.S. history. I mean, this is a convention at which delegates are throwing peanuts at a black camerawoman and saying, “This is how we feed animals.” This is not a convention for Eisenhower Republicans, Reagan Republicans or even W Bush Republicans. These are some crazy motherfuckers. It’s fitting that Christie said, “I was her son as I listened to Darkness on the Edge of Town with my high school friends on the Jersey Shore,” because Darkness was the album that saw Springsteen’s political ideas beginning to take shape in his music. It was where Christie first had to begin misinterpreting his beloved Boss. Now, in front of a stadium full of one percenters and people who don’t understand that the Republican party is not actually looking out for the 99%, Christie aligns himself with a guy who has made a career out of singing about the working man. Darkness on the Edge of Town tells stories about people on the fringes of society, the people barely hanging on…the people that Christie and his party are fighting so hard to further marginalize. How else has Christie perverted and contorted Springsteen’s music over the years to fit with his views? “Born in the U.S.A.” and “We Take Care of Our Own” are obvious ones, but what else? “Darkness on the Edge of Town” is about that black family that moved into Mrs. O’Malley’s house after she passed on. “The Rising” is about the upcoming revolution in Lubbock, Texas, after Obama gets re-elected. “The Ghost of Tom Joad” is about how we need to build a wall to keep Mexicans out of our country. “Death to My Hometown” tells the stories of teachers unions run amok, given their every whim until they destroy not only their school system but their entire community. “She’s the One” is a paean to Ayn Rand. The entire Seeger Sessions album is clearly intended as sarcasm. “Atlantic City” is about the rejuvenation of the Jersey Shore under Governor Christie’s tax breaks for big businesses: “everything that dies some day comes back” indeed. “Mansion on the Hill” proves that trickle down economics really work. “The Promise” is about Tim Tebow’s vow while at the University of Florida. “The Price You Pay” is about the ridiculous graduated federal tax structure; it’s essentially an essay backing Steve Forbes’s flat tax proposal. “Rosalita” is also about building a wall to keep the Mexicans out. “Glory Days” is about how awesome high school was, and not a desperate howl railing against imminent death.